Hello Handsomites! Eric and Robbie are talking about the brand spanking new Rise of Aurora West, the next chapter in the Battling Boy saga! They discuss the deeper emotional content and somewhat more mature subject matter, and the breadth of the Battling Boy universe! They also look at the week’s hottest books, including Captain America #25, Death of Wolverine #3, and Thor #1, and what they mean about Marvel and three of their biggest heroes! All of this plus discussion of Inktober and Middle Earth: Shadow of Mordor! This entry was posted in Episodes and tagged captain america, david rubin, death of wolverine, fiction squad, gotham academy, inktober, jt petty, middle earth:shadow of mordor, names, paul pope, the rise of aurora west, thor on October 6, 2014 by Robbie Dorman. Hello Handsomites! Eric and Robbie come to you once again with a lovin’ liter of podcast goodness! They review the week’s newest books (woe be unto them), continue with Volumes 7 & 8 of The Sandman retrospective, and discuss Anathem! All of that, plus a new entry of Rantin’ & Ravin’ with Alan Moore! So much awesomeness, don’t know what to do! This entry was posted in Episodes and tagged anathem, captain america, dead body road, inhumanity awakening, j bone, justice league, justice league 3000, mark waid, mesmo delivery, neal stephenson, neil gaiman, pulp friction, rantin' & ravin' with alan moore, regular show skips, superior foes of spider-man, the rocketeer/the spirit, the sandman, xcom: enemy within on December 17, 2013 by handsomeboyscomicshour. Hello Handsomites! Eric and Robbie are back with a brand new episode, chock full of goodness! They talk about the week’s newest books, including looks at Infinity and Zero Year…and only one makes it out alive! They talk Game of Thrones, and Robbie plays Final Fantasy Tactics on Eric’s recommendation. Finally, they have an in depth chat about Craig Thompson’s Habibi, one that cannot be missed! Tune in! This entry was posted in Episodes and tagged a feast for crows, afterlife with archie, batman, captain america, coffin hill, craig thompson, final fantasy tactics, game of thrones, habibi, infinity, marjane satrapi, persepolis, zero year on October 15, 2013 by handsomeboyscomicshour. Hello everyone! In this week’s episode, Eric and Robbie take on the epic tome known as Bone! They also discuss The World’s End, Plants vs. Zombies 2, and all the week’s hottest releases (the Villain’s Month boycott not withstanding). Also hear Eric attempt to stymie Robbie’s storytelling ability in Stump the Nerd! Don’t miss it! 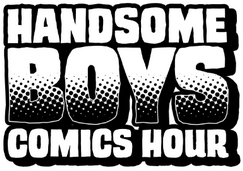 This entry was posted in Episodes and tagged astro city, avengers, bone, captain america, chris hardwick, eternal warrior, jeff smith, mars attacks judge dredd, plants vs zombies 2, stump the nerd, the nerdist way, the world's end on September 16, 2013 by handsomeboyscomicshour. It’s time for the Ocho Party folks, as Eric and Robbie give you Episode #8! This week, they discuss the history of Marvel, Monsters University, and Mastodon, compare Man of Steel with All Star Superman in Classic Breakdown, take a stab at a fake movie trailer, and as always, review the week’s biggest releases! You don’t want to miss this! This entry was posted in Episodes and tagged all-star superman, captain america, fake trailer, frank quitely, grant morrison, hawkeye, larfleeze, lazarus, man of steel, marvel, monsters university, sean howe, superman, superman/batman, the untold story on July 1, 2013 by handsomeboyscomicshour.